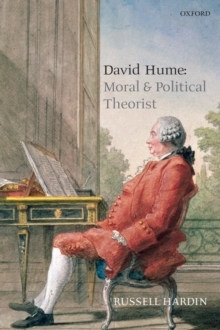 Russell Hardin presents a new explication of David Hume's moral and political theory. With Hume, he holds that our normative views can be scientifically explained but they cannot be justified as true. Hume argued for the psychological basis of such views. In particular, he argued for sympathy as the mirroring of the psychological sensations and emotions of others. By placing Hume in the developing tradition of social science, as a strong forerunner of his youngerfriend Adam Smith, Hardin demonstrates Hume's strong strategic sense, his nascent utilitarianism, his powerful theory of convention as a main source of social and political order, and his recognition of moral and political theory as a single enterprise.